Fall salmon seasons are about to hit their peaks in the coastal rivers from Washington to Northern California, and that means back-bouncing roe or floating a gob of salmon eggs below a bobber will be the go-to methods for many anglers to catch big kings. Feeling a big salmon crunch a cluster of roe while back-bouncing, or watching that bobber disappear under the surface is the thrill that makes fall kings such a thrill in the small rivers of the West Coast. Quality eggs, those prepared and cured properly, are often the difference between guides who catch limits and anglers who go fishless. Here are five tips to cure the perfect eggs for fall kings. Commercial cures are designed to put up salmon eggs straight out of the bottle. They are ready to use, and will catch fish as is. But customizing the cure can lead to even better success, and help those eggs fish and store longer. I have a ton of confidence in Pautzke’s Fire Cure. The stuff works great right off the shelf, won’t permanently stain your hands or boat like other cures, and is a more forgiving cure, meaning it won’t “burn” your eggs if you apply too much. 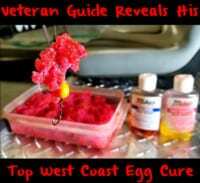 I like to customize it by adding borax and sugar to the cure before apply it to the eggs. I may add sodium sulfate to the cure (a tablespoon or so) if I am fishing on salmon that are well above tidewater. I also mix the colors. For fall kings, the color I prefer is obtained by mixing one-half Pink Fire Cure and one-half red. I mix a half cup of Red Fire Cure and half cup of pink Fire Cure in a bag, then add a half cup of plain borax and a half cup of sugar. This will create a deadly egg for fall salmon. The added borax helps preserve the eggs longer, so they can be stored in the fridge for several weeks and won’t spoil or mold. Cut the eggs into tennis ball size pieces for curing. You can cut into smaller pieces when you start fishing. If you cut the eggs into bait-size pieces while curing, you can end up with a lot of loose eggs, and the eggs may be too small for dirty water after the curing process is complete. I cure the eggs for three days in a Ziploc. This is done in the garage, at room temperature. The eggs will expel liquid, and then soak it back up. In doing so, they also soak up the borax and sugar, creating a large egg. After the eggs are cured, most of the juice has been reabsorbed. Salmon eggs should be dried before fishing. If you don’t dry them, they will milk out extremely fast and turn into a gob of white egg slime within a few minutes. I dry the eggs on a plastic screen, allowing air to circulate below the eggs. For bobber fishing, dry the eggs for a couple of hours. For back-bouncing, dry the eggs for 12 to 24 hours. The eggs should be tacky before using. For fast water, you want the eggs to be somewhat dry (they will re-hydrate when you start fishing them). This will make the eggs milk out slower and fish longer. I often roll the eggs in borax again and then bag them for fishing. By adding the borax to the eggs when curing, they last in the fridge for several weeks. Those eggs fish well. I store some eggs in the freezer for late in the season, or for use the following year. Eggs that will be used within a few months can be placed in a plastic bag for freezing. Eggs intended to be frozen for more than a few months keep better in a glass jar. A common mistake people make is cutting up the entire day’s bait supply at the beginning of the day. I avoid doing so. The eggs begin juicing out, and will dry out more, as they are cut into smaller pieces. During warm weather they can be hard and won’t fish well several hours into the trip. During rainy days, the eggs are often exposed to rain several times before being fished. It is better not to put all your eggs in one basket, as the saying goes. I watched a guide on the Elk River (in Oregon) last season cut up all of his eggs at the beginning of the day and then soak them while going over the chute by the hatchery. His entire day’s egg supply was ruined before he started fishing. 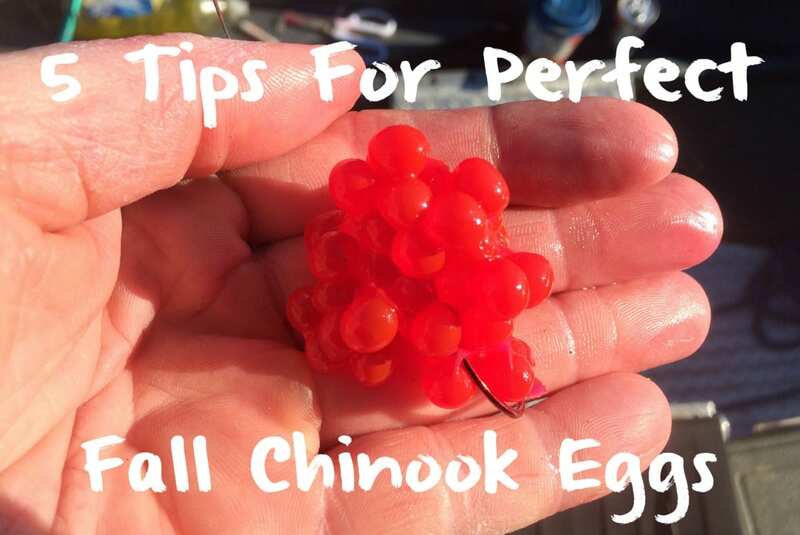 When cutting eggs into bait-size pieces, remember, you can always go smaller, but not bigger. I like to use eggs from the size of a quarter to golf ball for bobber fishing, and quarter or smaller for back-bouncing. I like to add scent to the eggs as I fish. 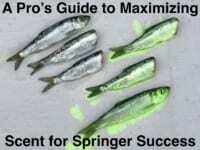 I often start with the base eggs, and apply bait oils or natural scents as I fish. Salmon have an extremely powerful sense of smell. A little scent often goes a long way. Sometimes just rolling a sand shrimp, piece of raw tuna or sardine fillets on top of the eggs will trigger a bite. Sprinkling sodium sulfate can trigger a strike. Liquid bait oils and scents can be the ticket. Experiment with different scents if you are not getting bit. Don’t overlook taking some unscented eggs from your cooler and fishing them when all else fails.